Honolulu, Hawaii — On Wednesday, September 21, 2011, Maluhia’s staff and volunteers hosted a dedication ceremony, recognizing the donors contributing to the completion of the healing garden. With funding assistance from Central Pacific Bank and Al Yazawa, M.D., Maluhia medical director, the Alewa Heights long-term care facility was able to develop this special garden. At the same time, Mr. Richard Takara, a participant (outpatient) of the Maluhia Adult Day Health Center, whole-heartedly donated his home-grown bonsai plants that he had cared for many years. 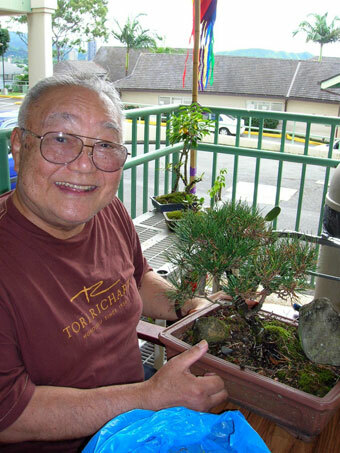 Mr. Richard Takara’s interest in bonsai began in the 1960s. Following an introductory bonsai class, he started growing a few plants at his home, which quickly turned into a large collection. Following his retirement in 2005 from Duty Free Shops at age 75, Mr. Takara suffered a major stroke in 2009 that affected the right side of his body. At the same time, Mr. Takara’s wife was admitted to a nursing home. As a result, Richard was left at home to care for himself for about a year. Fortunately, following on-going rehabilitation, in addition to recreational therapy, and a group/self exercise program offered by MADHC. Mr. Takara now has increased use of his right hand and has an easier time in overall body movement. As a result, Mr. Takara is able to continue to care for his donated bonsai plants at the Healing Garden, in addition to creating beautiful oil paintings! Maluhia is one of 12 facilities operated and managed by the Hawaii Health Systems Corporation. In addition to these community-hospital facilities, HHSC also oversees three non-profit affiliates. Established in 1996, HHSC is a public benefit corporation of the State of Hawaii. As the state’s safety-net healthcare system, HHSC continues to fulfill the state’s promise to provide quality, hometown healthcare.